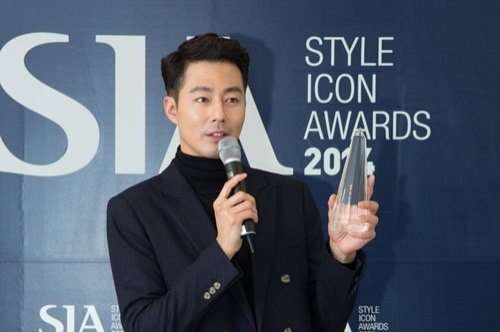 Actor Jo In-sung on Tuesday won the Style Icon of the Year Award -- the top prize at the Style Icon Awards -- for his leading fashion style. The award is given to the artist who led and influenced fashion trends the most in the past year in Korea. Jo boasted various stylish looks in the recent drama “It’s Okay, That’s Love” as a young writer who had been traumatized, the host company CJ E&M said. Based on a professional evaluation and international vote, 10 artists were picked for the main prize among 50 nominees who showed off a fashionable style and had a major influence on fashion trends this year. The list included Jo In-sung, Kim Soo-hyun, Park Hae-jin, Go Ara, Kim Hee-ae, Yoo Yeon-seok, TaeTiSeo, 4Minute, g.o.d and SISTAR’s Soyou. In addition to the main prize, actor Park Hae-jin received the K-Style Award for his stylish look. Girl group After School member Nana received the K-Beauty Award for her influence in beauty. WINNER, Sungjun and Han Groo were picked for the Rising Icon Award. Designer couple Steve&Yoni were awarded the Iconic Designer Prize. As part of the show, TaeTiSeo, Soyou and 4Minute made a special appearance following a special performance by Haha and Skull. 2NE1 rapper CL and globally renowned DJ Diplo also performed on a collaboration stage. The Icon of the Year winner last year was G-Dragon.